These days, most homes with satellite TV or digital terrestrial TV also have more than one TV set. However, secondary TVs require either a separate receiver for each screen (which is rather expensive, especially if it's a Sky Digital pay-TV that you're watching) or a means to distribute the signals from the receiver to more than one TV screen. UHF distribution is the most commonly used technique but there is one big problem with any UHF distribution system - it uses UHF! Although a modulated UHF signal is relatively easy to send around the home and cheap to service at each end of the cable, it provides the worst possible quality of video onscreen. What's more, the audio carried is also low quality and in mono only. We have looked at a number of techniques and products to distribute signals in other formats and these methods are slowly gaining popularity among digital TV enthusiasts. One of the easiest systems to implement is based on CAT5 computer network cable and Keene was quick off the mark with a system (the CAT5 Blaster) to use that a couple of years ago. Now a simpler and cheaper system has been introduced - the C5KDA distribution amplifier. The CK5DA is a modular system with a single distribution amplifier unit and up to four receivers for secondary TV screens. Although it is relatively expensive (certainly far more than any UHF-based system), it has the potential to pipe decent quality TV around the home. The system works by using each of the four twisted pairs in a CAT5 cable to carry one signal in a 'balanced' format. This means that rather than send the signal as a voltage relative to a common earth connection, the two wires are used to carry voltages opposite to one another. The two wires are entirely unshielded and simply twisted together so that any interference picked up by one is also picked up by the other and they cancel each other out. The other great advantage of CAT5 cable over the co-ax is that it's pretty cheap (about £25 for a 100m reel) and easy to lay around the home because it's tough and flexible. You can even buy long ready-made cables if you don't want to wire up your own. A CK5DA system comprises a distribution amplifier that converts AV signals for transmission down the CAT5 cable, and would normally sit near your AV equipment, and one or more receiver units that sit at a remote TV and convert the CAT5 signals back to 'normal' AV. The CK5DA distribution amp unit is not very impressive to look at, but then it's not going to be on display. 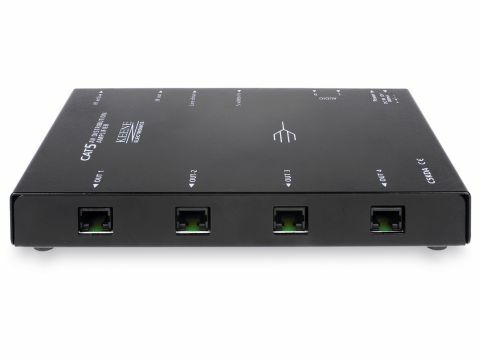 It's housed in a black steel case about the size of a paperback novel, and has connectors down both sides - the four RJ45 CAT5 sockets on one side and the AV inputs and power socket on the other. The power supply is a separate in-the- plug type. The receiver units are small plastic cases with a single RJ45 socket and AV output sockets. The receivers derive their power from the amplifier down the CAT5 cable. Once you have your CAT5 cables in position (or you may be using a redundant computer network after upgrading' to wireless), connecting up the system is very simple. The AV source is connected to the amplifier's S-video socket for video and the two phono sockets for the audio input. If your source does not produce S-video (Sky receivers do but standard Digiboxes don't) then a short adapter cable allows a composite video signal to be connected to the S-video socket. At the secondary TV, the receiver unit has the same connections (again, a composite adapter can be used if required) for the TV and then the CAT5 cable connects the two units. This is repeated for up to three more receiver units and remote TVs, the power supply is plugged into the amplifier and away you go. Pictures and sound delivered to the amplifier are sent to all the TVs. Each receiver unit also has a socket for a remote eye' infrared receiver (a relatively large unit) and the amplifier connects to a small IR emitter so commands from a remote handset used at a secondary TV are relayed backwards' down the CAT5 cable to the amplifier and to the AV equipment. The performance of the CK5DA is quite extraordinary. Our unit was set up with a Sky HD box feeding an HD Ready TV via the CK5DA and 50m of CAT5, and direct to the same TV. Of course, S-video produced a better picture than composite video but it really was quite hard to tell whether the signals were direct or through the CK5DA. The transmission system produced almost no video noise, loss of detail, edge effects or colour changes. Bright colours are a little affected - lightening so that the likes of yellows and green look a bit washed out - particularly when composite video is used, but the pictures are almost as sharp and clear as the 'originals'. Even comparing S-video through the CK5DA with a direct HDMI connection was not too damning. It really is a remarkable implementation of the idea. The audio is perhaps less impressive, if only because the analogue audio from the Sky box isn't that brilliant in the first place. Nevertheless, there are only the most marginal amounts of distortion or hiss. The length of the cable used had little effect on the result. Keene reckons the system is good for 100m (far more than any normal domestic setup will need) and have included a line drive' switch to boost high frequencies on longer runs. When the units were tested with a half-used reel of CAT5 cable - about 150m in length - there was little noticeable additional degradation, and the line drive facility probably did more harm than good. The IR relay also works well, although the emitter is on a short cable (only about 1m) and is quite difficult to position where it can reliably trigger the equipment. For a simple distribution of a TV signal to multiple screens about the home, the CK5DA system is hard to beat. The quality of pictures (and sound) is excellent and it's easy to set up and transparent in use. The emitter cable could be longer, Scart connections would make setup easier and, of course, it would be nice to have some form of remote signal selection. However, the system is not cheap as it stands so anything that would increase the price would be counter-productive. As it is, anyone wanting quality TV signals routed around the home can certainly achieve that with the CK5DA.